Posted on March 2, 2019 March 2, 2019 Categories Bluegrass ConspiracyTags Barbourville Kentucky, Corbin KY, Exit 29Leave a comment on Tick. Tock. I can’t explain why I am led down the paths I am, but I am blessed to have the time and means to explore some of the winding ways. I reluctantly understand I can’t possibly explore them all. There is a war waging around us. A war between good and evil: humanity versus the Deep State. Kentucky’s been lost in the struggle. That’s why Delmar Partin rots in prison, a casualty of the battleground where these two forces collide. I know organized crime was behind the murder of Betty Carnes, the fruit of over two and half years of research and interviews. 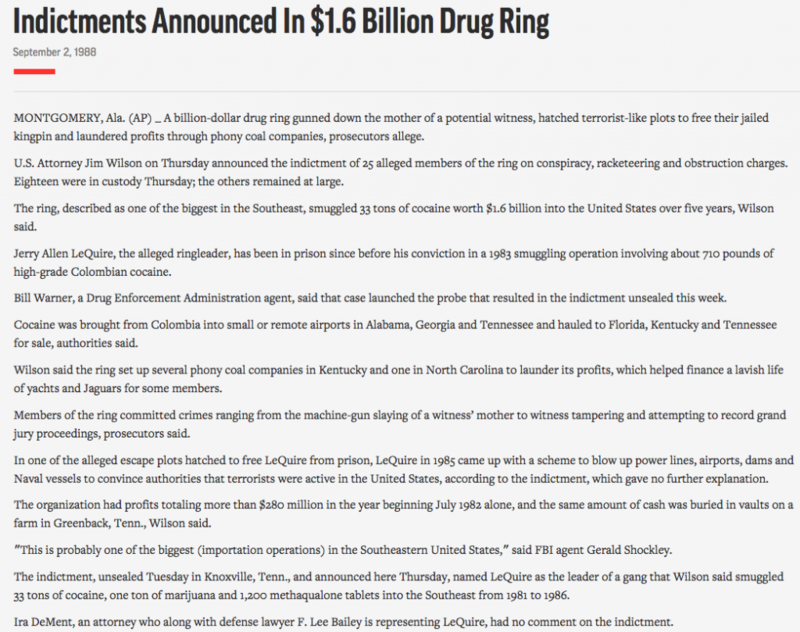 I know this group has been permitted to operate, unabated, for going on forty years, if not longer, with the blessing of prosecutors and law enforcement alike. How this happened is simple: once reputable law enforcement agencies were compromised by the infiltration of these bad guys into their ranks. Due to these compromised officials, the lack of oversight and regulation, and the ability to hide underground in spaces that can rival the size of a small city, Kentucky, and the bordering regions of southwest Virginia and east Tennessee have become hallowed ground for the relationship between the Deep State and organized crime: Murder, Inc.
As always, you can contact me at everybodyhatescharlie@yahoo.com. 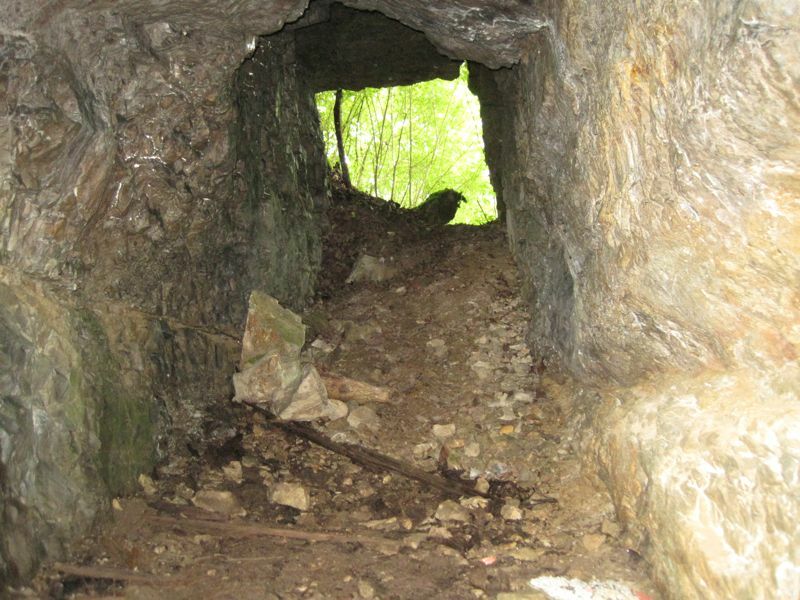 Jonathan Swift’s Long Lost Silver Mine- Found? The property owner’s neighbor, Cédric, worked the mine decades ago. He claimed there was a seam of silver that was discovered to rise one inch a foot back in the mountain, and the seam went on for miles. Looking down into the possible secret silver mine. Water prevents passage beyond approximately fifty feet. The mine was being worked in approximately the 1930’s. Whether the ore being mined was silver or another type of valuable material, it was special enough that the miners placed the ore into wooden boxes before carrying it out of the mine and loading it into covered trucks, as if to keep the material being mined a secret. It was even more mysterious that the covered trucks waited until the cover of night had settled in to travel to their destination, never leaving the mine before midnight. One night, the mysterious miners packed up and left without explanation. 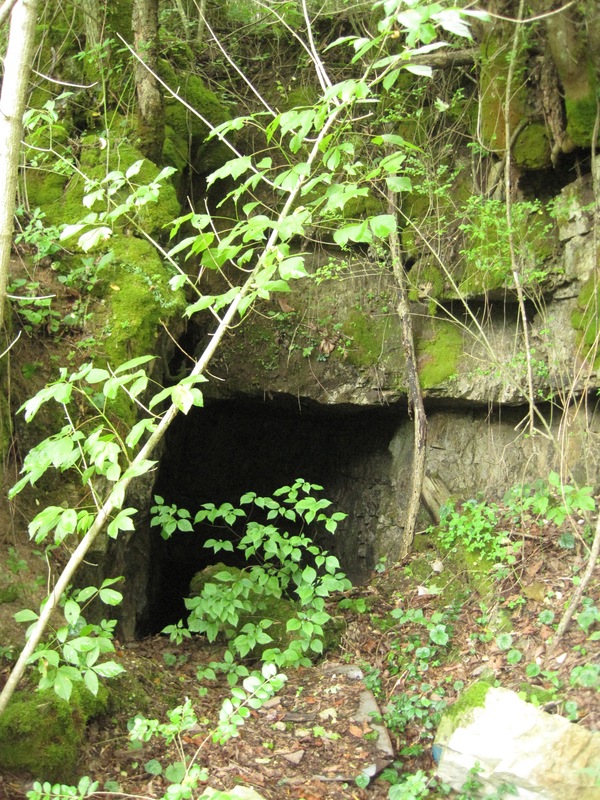 No one ever came back until approximately 20 years ago, when the owner received a sole request for permission to re-open the mine, a request which he denied. Cédric, the old neighbor who had worked the mine, was rumored to have possessed a special healing ability. If a person got hurt and was bleeding bad, all someone had to do was tell Cédric and he could stop the bleeding, whether the person was in his presence or not. 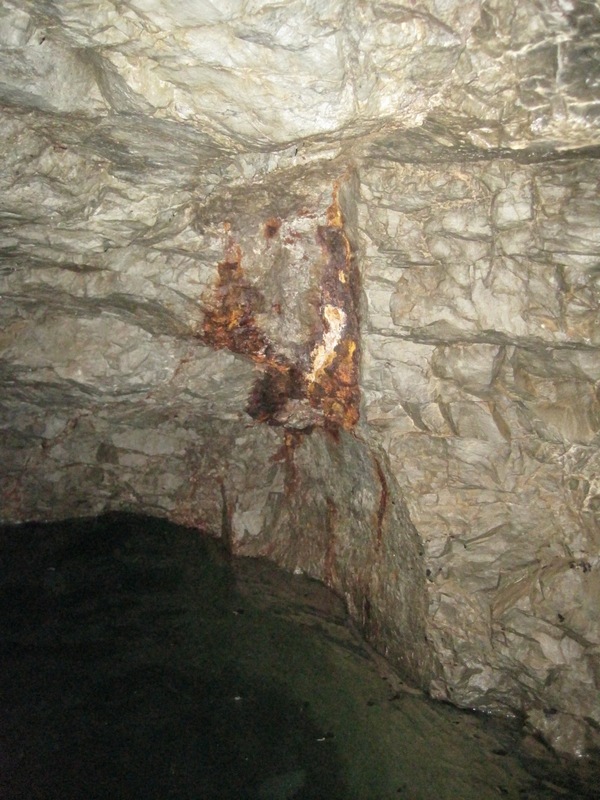 We will probably never know if this is a true iron oxide-copper-gold seam. The owner himself lived in the same valley as a child at the time the mine was being worked. He disclosed that he, his brother and father saw what he reported as a “searchlight in the sky, making a big, wide circle around them.” They witnessed this light several times in the night sky during the 1930s and 1940s. Posted on May 14, 2017 November 18, 2017 Categories Archaeological Marvels: Discovery and Demise, Cumberland Gap Tunnel Conspiracy, The Oak Ridge ConnectionTags Cumberland Gap Tunnel Conspiracy, Jonathan Swift Silver Mine, Oak Ridge underground, silver in AppalachiansLeave a comment on Jonathan Swift’s Long Lost Silver Mine- Found? Phipps Bend Missing Nuclear Reactors- part of Carter’s hostage negotiations with Iran? 1981: Did the U.S. trade A Phipps Bend nuclear reactor for the release of the U.S. embassy hostages in Iran? We’re told the Iranian Revolution of 1979 killed the deal- but did it? November 4, 1979: 52 Americans from the U.S. Embassy in Tehran were taken hostage, and held for 444 days. Remember, up until this crisis and the revolution, plans had been made to sell nuclear reactors to Iran. The Chicago Iron and Bridge worker interviewed in May of 2016 said he wasn’t sure what ultimately happened to the second vessel, but he did know it had not been sent to Phipps Bend. He said, “several RPVs were being stored onsite in Memphis” at the time. Sending a nuclear reactor to Iran wouldn’t have been the most popular move an already unpopular President could have made. If this did happen, it well explains the lies and secrecy fed to the American public concerning the second reactor. Iran has now paid for a nuclear reactor it appears they won’t receive, in addition to paying an additional $400 million to the United States for military equipment prior to the 1979 uprising. But the nuclear reactor they paid for back in 1979 was never brought up again. Was this reactor a secret part of the 1980-1981 hostage negotiations? Notice the issue of the paid-for reactor they (supposedly) did not receive is not mentioned. It’s almost as if Iran has learned how to make the United States keep its nuclear promises. (1) The National Security Archive. “The Nuclear Vault: U.S.-Iran Nuclear Negotiations in 1970s Featured Shah’s Nationalism and U.S. Weapons Worries.” Burr, William., Jan. 13, 2009. 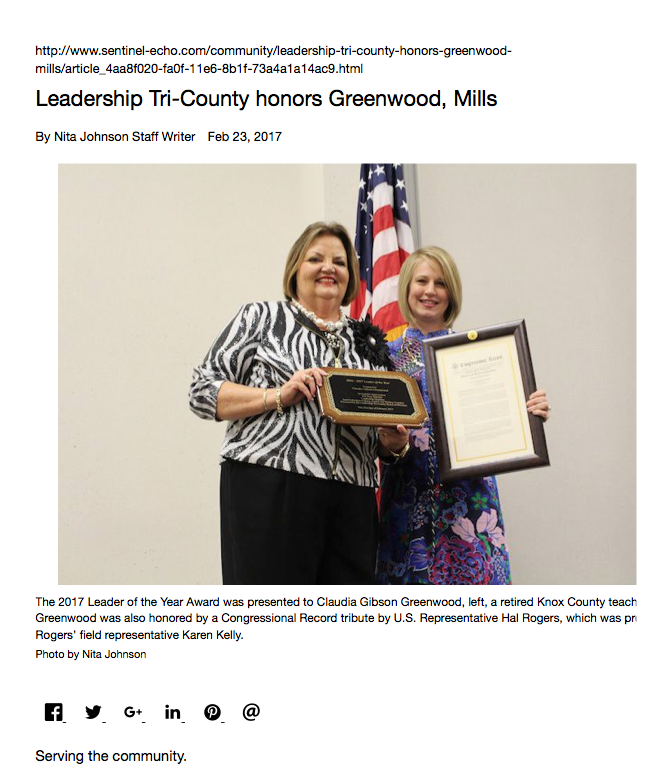 (2) The Kingsport Daily News. “Unit 2 on Way.” June, 1981. (3) Iran’s Weapons of Mass Destruction: the Real and Potential Threat. Cordesman and Al-Rodhan. The CSIS Press (Center for Strategic and International Studies.) 2006. (4) “How Iran became a ‘Nuclear State. '” Jeremy Bernstein. The New York Review of Books. Feb. 19, 2010. (5) “5 Things You Need to Know About the $400 Million America Sent to Iran.” Fortune.com. Shawn Tully. Aug. 5, 2016. (6) “Iran releases 5 detained Americans, including Washington Post reporter.” Nahal Toosi. Jan. 16, 2016. Politico. Posted on March 3, 2017 November 18, 2017 Categories Cumberland Gap Tunnel Conspiracy, Phipps Bend Nuclear Plant MysteryTags 1950's, 1960's, 1970's, Cumberland Gap Tunnel Conspiracy, missing nuke reactor pressure vessels, Phipps Bend Nuclear PlantLeave a comment on Phipps Bend Missing Nuclear Reactors- part of Carter’s hostage negotiations with Iran? The former workers of Foote Mineral are BY LAW eligible for compensation under the EEOICPA. Until Washington does the right thing by these workers, this information is staying right here. Back in 1952, Foote Mineral picked Sunbright, Virginia (a community very close to Duffield) to build the world’s largest lithium plant. One of the main reasons this location was chosen was due to the large reserves of high grade limestone located on site. Spodumene ore was shipped in from Kings Mountain, North Carolina, mixed with the limestone, and subjected to a chemical process in order to extract the lithium from the spodumene. The limestone was mined using the room and pillar method. The result was large underground rooms that stretched for a reported 20 some miles. The temperature, being 200 feet underground, was a constant 55 degrees. One day, miners blasted into a cavern that contained a huge waterfall. 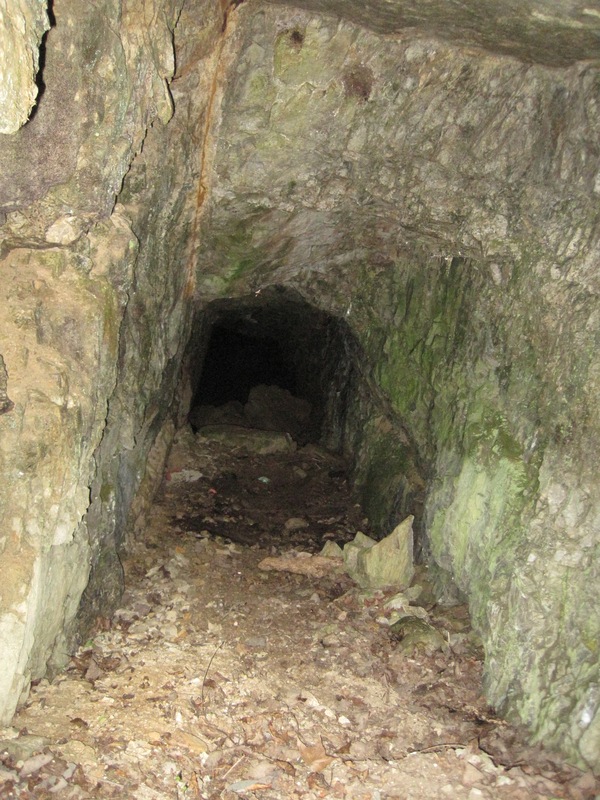 This cavern was actually a back entrance into the mine at one time. 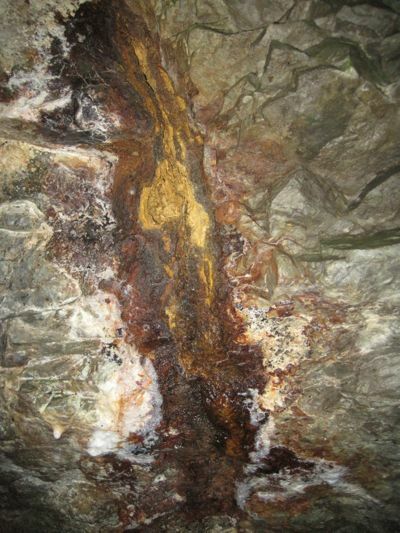 Sediment buildup from running water has since reportedly made the connecting passageway too small to pass. 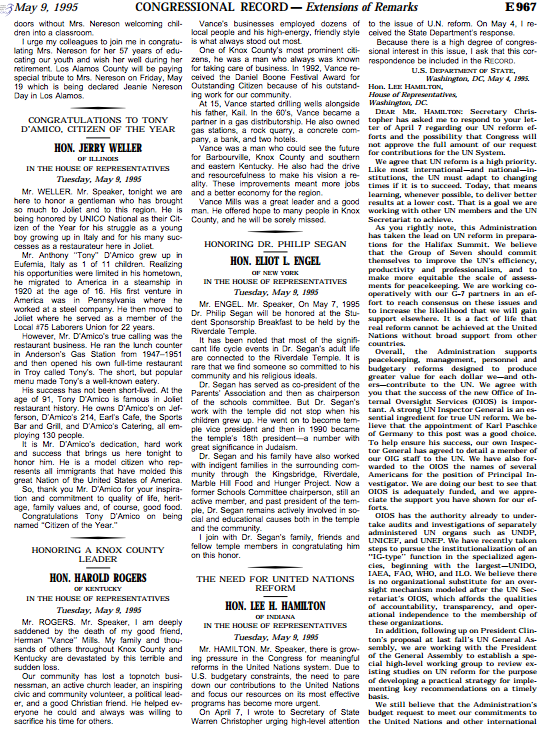 Some time after Foote and its following successors left the Sunbright plant in Duffield, a company called Allegheny Construction stepped in and indicated their intent to reopen the limestone mining operations portion of the now abandoned property. (1) The limestone mining operations never materialized. But the name of one of Allegheny’s Construction’s chief company officers caught my eye: George Foresman. George Foresman became the former Under Secretary of Preparedness at the Department of Homeland Security in 2005, then became the Under Secretary for National Protection and Programs at Homeland Security until he left in 2007, coincidentally the same year Allegheny Construction received their $6.83 million for an undisclosed facilities project. I ran into the caretaker of the abandoned Foote property a few months ago. My friend who I was with, mentioned to the caretaker that I would like to take a tour of the limestone mine. The caretaker said I needed to talk to George Foresman of Allegheny Construction. 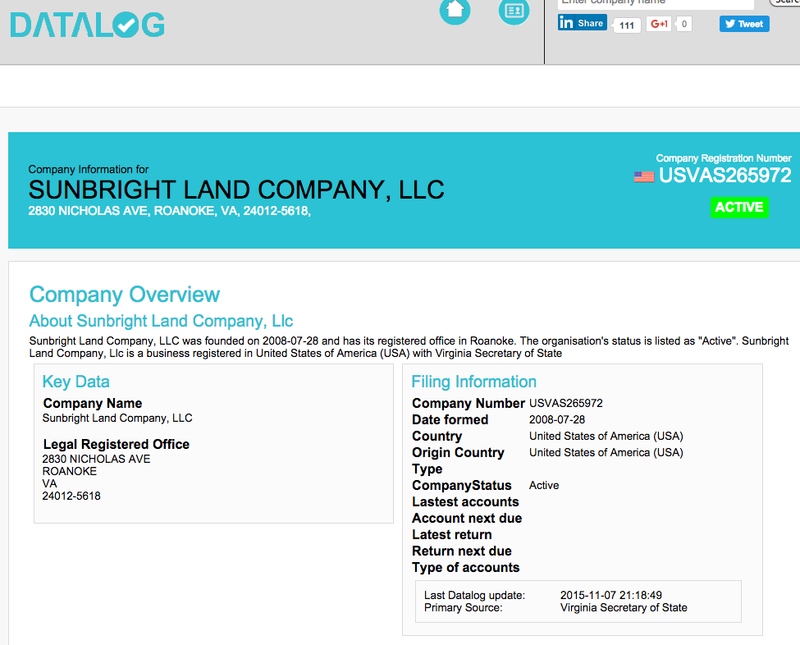 and Sunbright Land Company, LLC. This is going to get messy. But stay with me. Interestingly, I found a 2006 report where the Department of the Army allocated $6.83 million to Allegheny Construction for “maintenance, repair or alteration of other conservation and development facilities.” (2) Was this money used to retrofit the limestone mine at Duffield for an underground government data center? We do know they never reopened mining operations like they implied. Who really owns the old Foote Mineral property? Which brings us to the Sunbright Land Company. Scott County, Virginia property records indicate that Sunbright Land Company bought the former Foote Mineral plant site and limestone mine on September 25, 2009. 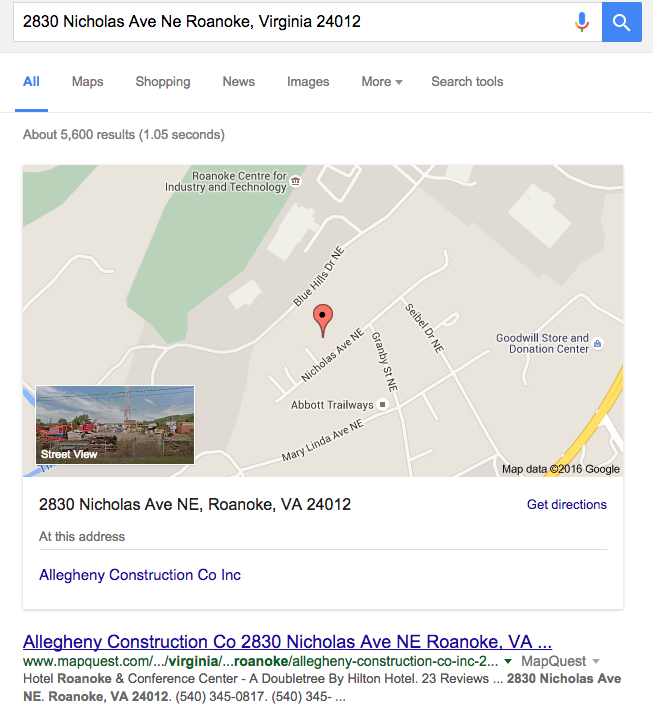 Remember, Sunbright Land Company is also located at the same address as Allegheny Construction, and Secure Mountain: 2830 Nicholas Avenue, Roanoke Virginia. 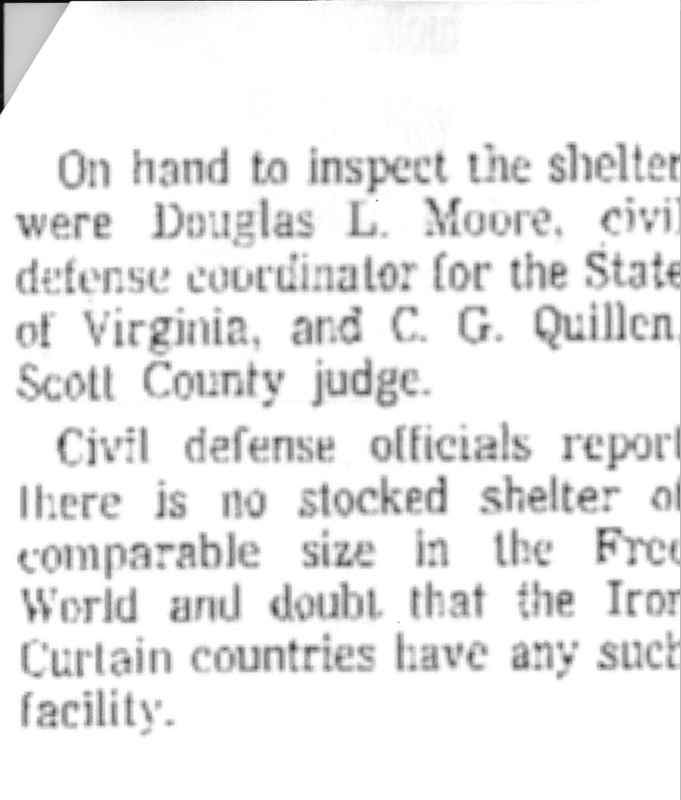 This article is from the Kingsport Times, 1964. I have much more information to share about this underground facility in Duffield Virginia, and will do so in future posts. 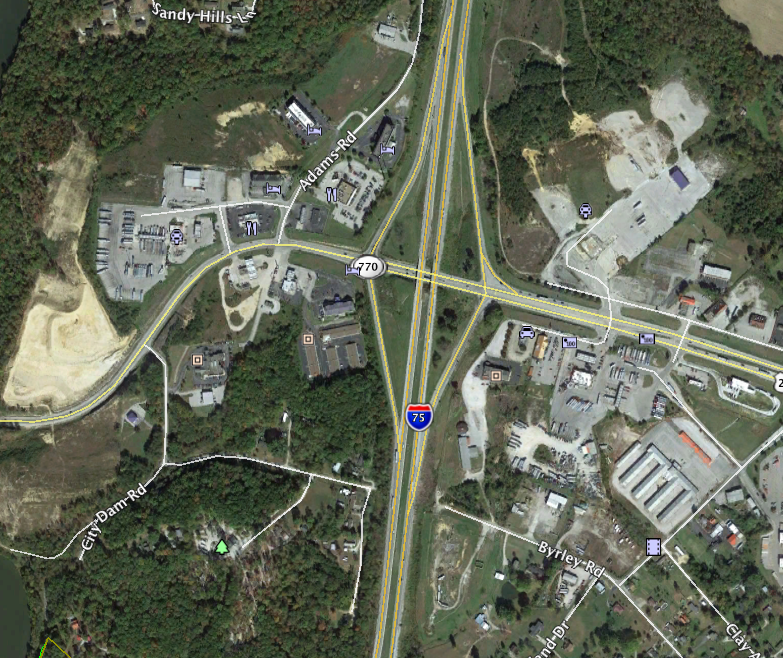 (3) “Scott supervisors approve permit for data center in Duffield.” Kingsport Times News. November 7, 2012. (5) George Foresman biography, Capstone. National Defense University, Department of Defense. (8) “Colo. firm employs most retired officers from mentor program.” Dec. 29, 2009. Is the 2nd Missing Phipps Bend Nuclear Reactor Pressure Vessel below the Ozarks? We have no proof Unit 2 ever arrived to Phipps Bend. Let’s go back to the last known location of this missing reactor pressure vessel. Unit 2 was being built at North America’s largest waterway- the Mississippi River. The Arkansas River is a major tributary of the Mississippi, and just as easily traversable by barge. The Arkansas River leads straight to the Ozarks and the Ozark National Forest, where there were numerous reports the federal government was building an H-bomb plant there. The underground topography in the Ozark area is quite similar to that of northeast Tennessee, southwest Virginia, and southeast Kentucky. Karst/limestone landforms, especially caves, many large and miles long, are abundant in the Ozarks. There seems to be a universal desire for a better ‘ole [hole] on the part of all us H-(for hapless) creatures in this H-bomb age. Anyone who went through the construction period on the Southwestern Proving Ground here isn’t going to have much stomach for another war plant–however much the state is intrigued by published reports that the government is considering establishing the proposed Hydrogen Bomb plant in the Ozarks. 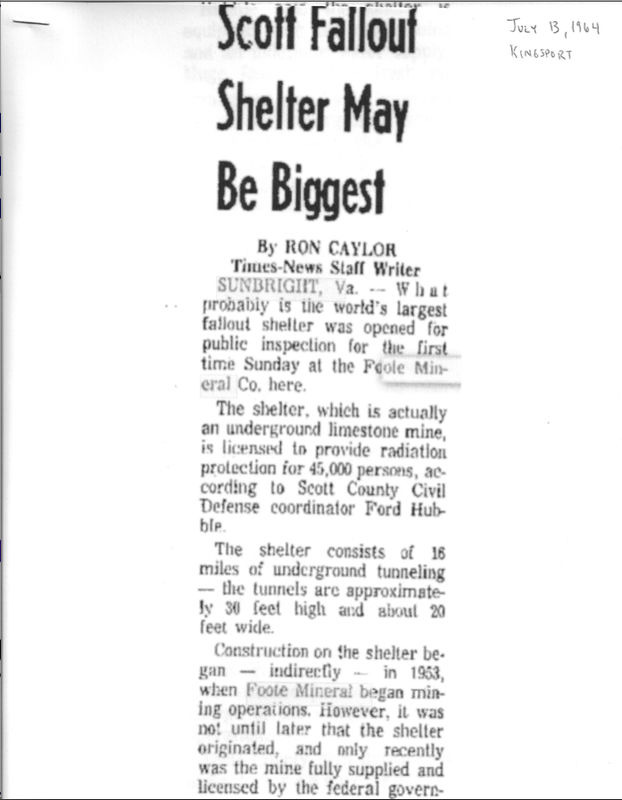 Just as I theorized the official announcement they had chose Alabama as the site for the nation’s future nitrate plant was disinformation to direct attention away from a secret facility at Cumberland Gap, so I wonder if the final announcement that South Carolina would get the H-bomb plant was also disinformation, intended to protect a secret facility located deep in the Ozarks? Did the 2nd missing Phipps Bend RPV ultimately become part of a secret nuclear submarine facility somewhere in northern Arkansas? I followed the footsteps of a second Chicago Bridge and Iron Nuclear worker, whose specialty was reactor pressure vessels. One year after the completion of the second Phipps Bend RPV, he left CB&I to perform inspections on a new power plant construction (1982). The name of the plant is not indicated. Then for the next thirty years he is a senior project manager with a large, worldwide nuclear services outfit. The only problem is, this nuclear outfit has no facilities anywhere near this gentleman’s home base: Jonesboro, Arkansas. Jonesboro is approximately 60 miles from the Ozarks. Interestingly, I found several career listings in Bay, Arkansas, for mechanics to support nuclear weapons security missions. Even though the jobs are listed under Arkansas (not far from Jonesboro), it indicates applicants will be at the Naval Submarine Base Kings Bay, Georgia. The company behind the job listings does not appear to have any facilities in the Bay, Arkansas area. So why are the jobs listed geographically for the Ozark region? In July 1951, Congress authorized the first nuclear submarine to be built. Could the Mississippi River and the Ozarks be part of a production line for the construction of naval nuclear submarines? Compartmentalization is key to the success of government defense programs. 1.) Construct the submarines at one location. 2.) Build their power supplies at another. 3. )Store/produce weaponry at another location 4. )The submarine travels down the production line until completed and ultimately sent to its destination. The idea that there is a supply chain across the eastern United States for our nuclear naval submarines was first presented to me by a colleague. I cannot claim credit for this theory. This colleague went through great hardship attempting to ascertain the truth; understandably, he may not want to return to this research. But he does deserve recognition for this theory, even if I cannot identify him by name. Thank you, W, and I’m very sorry for what you went through. (1) “Outdoors” by Mark Aldeen. Daily News. March 18, 1977. 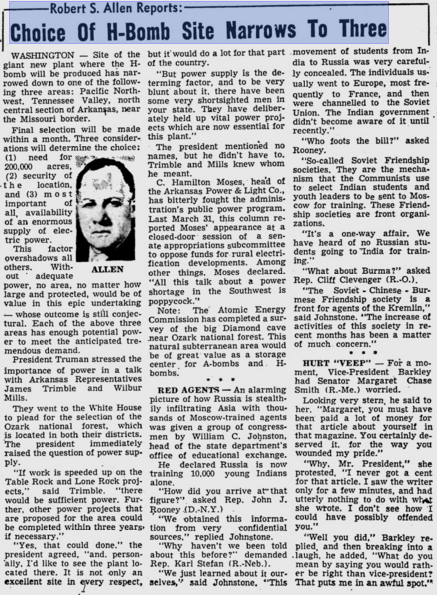 (2) “Atomic power protest ends in 180 arrests.” The Journal News. 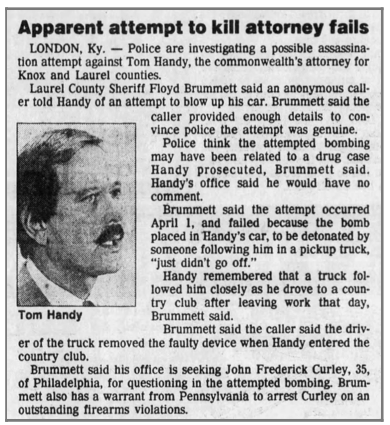 March 10, 1979. 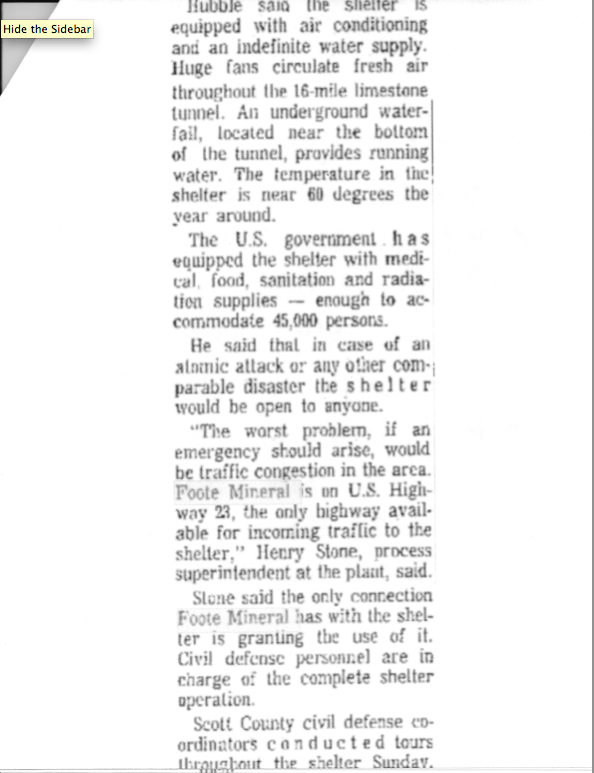 (3) “Ozark cave discussed as an H-Bomb refuge.” St. Petersburg Times. March 22, 1950. (4) “Our Daily Bread.” Alex Washburn, editor. Hope Star. August 19, 1950. 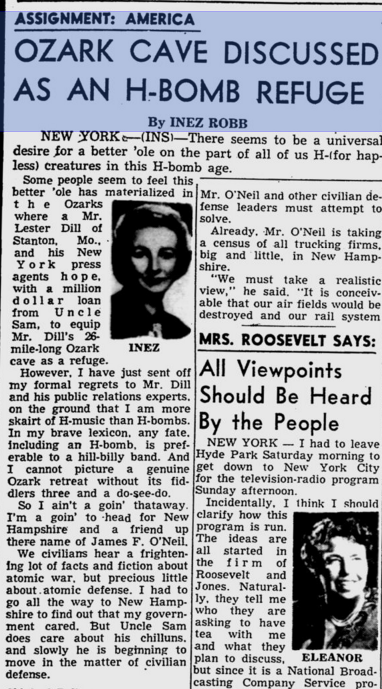 (5) “Choice of H-Bomb site narrows to three.” The Evening Independent. August 16, 1950. (7) “TVA stall in curbing N-program reported costing $2-$4 billion.” The Tennessean. July 31, 1981. (8) “Submarines Float Down the Mississippi.” The Montana Standard. May 28, 1942. (9) Personal phone conversation. Source identity protected. May 17, 2016. Posted on May 18, 2016 November 18, 2017 Categories Cumberland Gap Tunnel Conspiracy, Ozarks Secret Nuclear Facility, Phipps Bend Nuclear Plant MysteryTags Cumberland Gap Tunnel Conspiracy, deep underground military base Ozarks, H-Bomb facility Ozarks, missing nuke reactor pressure vessels, Oak Ridge underground, Ozarks hydrogen bomb, secret nuclear facility Ozarks3 Comments on Is the 2nd Missing Phipps Bend Nuclear Reactor Pressure Vessel below the Ozarks?